Catastrophes such as fires, storms, and flooding can cause great damage to a church property and the important contents in the building, including altars, paintings, upholstery, and historical documents. If your church property has sustained fire or water damage, call AllStates Restoration at 888-651-2532 for 24/7 quick service. 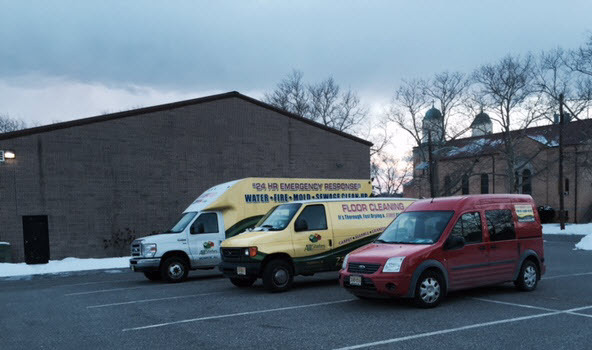 Our emergency restoration crews prepare to dispatch a restoration crew to your church in our NJ, NY, CT and PA service area. When Church water damage take place, AllStates Restoration will work directly with your commercial insurance company to restore your church property and contents back to like before condition, as your church insurance coverage typically protects your church property and contents from risks of water damage, fire damage and smoke and soot damage in addition to mold. We take care of the documents with direct billing. 24-hour Fire, Water, Mold, Storm & Wind Damage Restoration Services. We are ready to take your call at 888-651-2532. If you live in New Jersey, New York or any other city in the Tri-State area include CT and PA, contact AllStates Restoration for 24-7 water and fire damage restoration services. We provide a full range of commercial restoration services to cleanup, repair, reconstruction and restore your church. Storm & Flood Damage Restoration. Air Duct System Smoke Removal. Board-Up Structure, Tarping & Temporary Fencing. Contact Us now for fire and water damage services in our NY NJ service area. AllStates Restoration’s expert contents crew can repair, rebuild, and bring back items including altars, Wood Furniture, Seats & Pews, Upholstery, Fabric & Draperies, Carpeting & Rugs, Electronics & Metal, Sculpture, Paintings & Statues. Our contents crew is readily available 24/7 to dispatch to your NY NJ location church to sort, pack, transport, clean and restore your contents. Our expert professional services consist of:. Call us now at 888-651-2532 we are ready to take your call to begin the contents restoration process. [wc_box color=”secondary” text_align=”left”]AllStates Restoration employs IICRC S500 standards to fix, rebuild, and recover your church property and furnishings and contents performing our services as a licensed construction and water damage restoration company in NJ. Our IICRC Certified Field technicians are trained and licensed to complete all of our water damage restoration services. Here’s what you can count on from AllStates Restoration throughout our free examination and water damage restoration process:. Free Water Damage Evaluation, Estimate and Recovery Plan. Water Source Identification & Flood Containment. Organize & Appraise and Restore Damaged Contents. Water Removal Using Truck Mounted Equipment. Water Extraction, De-humidification, and Structure Drying. Disinfect Surfaces & Clean Air With Ozona Equipment. Structural Repair & Construction and Reconstruction Services. During the property restoration process, AllStates Restoration’s field technicians will provide you and your staff with regular updates regarding when each room or building of the church will be completely recovered and ready for use by you and your parish. To schedule Churches Disaster Restoration Inspection appointment, call 888-651-2532 or click here.